Let’s talk about the new Nissan Frontier in El Paso, Texas. This gorgeous creation is Nissan’s latest and most incredible Frontier yet: a glorious mix of sleek, impeccable style and powerful engineering, with some of the most incredible performance tweaks we’ve seen yet. But the Frontier itself isn’t new. In fact, the line first got its start in 1997, with the Nissan D22 Frontier regular cab. This compact truck was revolutionary at the time; not only did it boast most of the features drivers wanted, but it was also remarkably safe and more affordable than the competition, too. Nissan sold thousands in the first year and the fanbase was officially cemented into permanency at the same time. Over the years, Nissan has continuously improved the Frontier with better features, more safety points, and even higher-tech devices to make driving more enjoyable and compatible. These days, every Frontier ships with a long list of features meeting just about every potential need, whether it’s more MPG or just the right plug for your Apple or Android devices. Ultimately, it comes down to this: Nissan is all about customer service. The new Nissan Frontier in El Paso epitomizes this by being a shining example of craftsmanship, durability, and style. It’s a great truck to drive and even better vehicle to own long-term. With an affordable MSRP, the Frontier’s line is far from the most expensive mid-size pickup available to date. In fact, even Nissan itself has more expensive luxury trucks available, but that's exactly why we like the Frontier. This unassuming pickup is priced in just the right spot to ensure that families, contractors, and the average American can afford it, even on a modest income. But just because the Nissan Frontier is affordable, doesn’t mean they’ve taken costly shortcuts with the design. You can still expect unparalleled quality and durability; the truck is just a tiny bit smaller than Nissan’s other pickup models to compensate for the lower price. For most drivers, the slight difference is negligible. Even though the Frontier is smaller than its competition, you’ll never feel cramped or claustrophobic when driving. There’s plenty of legroom in the front and in the back to let passengers stretch out and relax on long drives. Comfortable seats provide excellent support, eliminating back pain, and while you won’t often likely use it often in El Paso, there is even a seat warming feature. 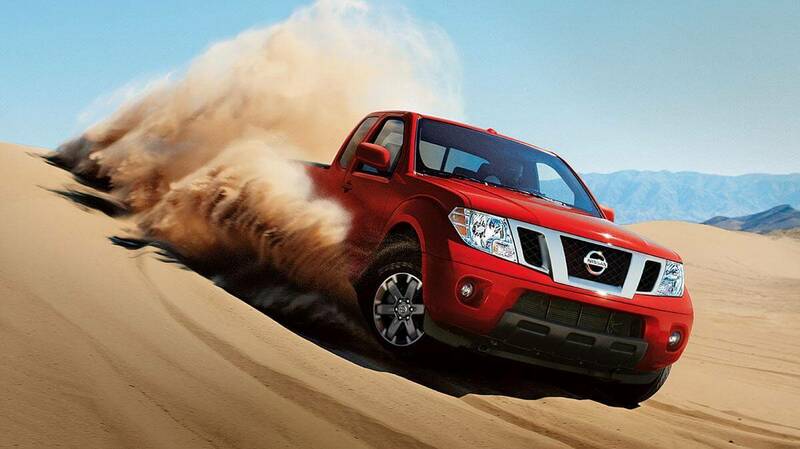 What we love most about the Nissan Frontier is the fact that it’s incredibly reliable. It might not be the fastest or even the most powerful in its class, but it can take just about anything you throw at it, bounce back, and then ask for more. The Frontier pickup truck as a whole is packed with a decent amount of horsepower, a significant amount of torque, and the option for two-wheel or four-wheel drive. What does this mean for drivers like you? Essentially, you have options when it comes to how your Frontier performs and feels on the road. The entry level model is in and of itself a dream to drive, cutting corners and charging through rough roads without skipping a beat. But some drivers just want more. For the discerning (or just the performance junkies), Nissan anticipated their needs with a long list of optional models that extend performance and customization. We’re talking about off-road features, like bigger tires with wider wheels that keep you more stable in even the rockiest and muddiest mesas, higher horsepower, and rugged all-terrain tires. The Nissan Frontier is an incredibly versatile pickup. It’s perfect for drivers who are focused on quality, performance, and handling, which is what matters most. The Frontier is honestly a joy to drive, especially for adventurers and people who need the space for basic work duty. It transitions almost effortlessly between tight city roads and cruising along the highways and backroads of Texas, even when driving conditions are questionable. Reviewers were extremely pleased with the optional heavy-duty shocks; they eliminate all but the roughest bumps and terrain impacts. Suffering from pack rat syndrome? Traveling often? Don’t worry; the Frontier ensures its smaller size doesn’t hold you back. Ample cargo space gives you plenty of room for your favorite items, whether they’re for work, play, or simple transportation. Hauling heavy items? Check out the S V-6. This specific model nets you a large amount of hauling capacity – perfect for contractors, construction workers, and sports aficionados. It’s a great choice for RVers and anyone hauling trailers, too. As for the truck bed itself, there are three specific models to choose from: the King Cab, the Crew Cab, and the Crew Cab Long Bed. As you might have suspected from the name, the Crew Cab Long bed is the largest and has the most space, letting you really pack it all in and then some. Most drivers will do fine with the standard King Cab; the others are just nice to have. If you’re still unsure about which Nissan Frontier model is right for you, head on down to Casa Nissan to test drive one for yourself!